Meresynergy2212 | What Is Hallux Abducto Valgus? Bunions (hallux valgus) are often described as a bump on the side of the big toe. But a bunion is more than that. The visible bump actually reflects changes in the bony framework of the front part of the foot. 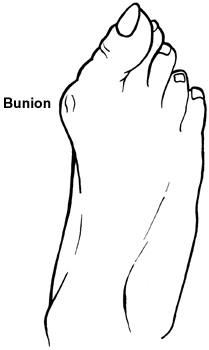 With a bunion, the big toe leans toward the second toe, rather than pointing straight ahead. This throws the bones out of alignment, producing the bunion’s « bump. » Bunions are a progressive disorder. They begin with a leaning of the big toe, gradually changing the angle of the bones over the years and slowly producing the characteristic bump, which continues to become increasingly prominent. Usually the symptoms of bunions appear at later stages, although some people never have symptoms. Sometimes observation of the bunion is all that’s needed. A periodic office evaluation and x-ray examination can determine if your bunion deformity is advancing, thereby reducing your chance of irreversible damage to the joint. In many other cases however some type of treatment is needed. Early treatments are aimed at limiting the progression of the deformity and easing the pain of bunion or an associated joint. Conservative treatments such as orthotics can achieve this but they won’t reverse the deformity itself. These options include changes in shoewear. Padding. Pads placed over the area of the bunion can help minimise pain, but will not stop the progression of the bunion. Activity modifications. Avoid activity that causes bunion pain, this could include standing for long periods of time. Medications. Nonsteroidal anti-inflammatory drugs (NSAIDs), such as ibuprofen, may help to relieve pain. Icing. Applying an ice pack several times a day helps reduce inflammation and pain. Orthotic devices. Orthotics are the mainstay of non-surgical treatment for bunions. The best way to reduce your chances of developing bunions is to wear shoes that fit properly. Shoes that are too tight or have high heels can force your toes together. Bunions are rare in populations that don?t wear shoes. Make sure your shoes are the correct size and that there’s enough room to move your toes freely. It’s best to avoid wearing shoes with high heels or pointy toes.